We are constantly looking to add new and exciting bounce houses to our inventory. We also take great pride in providing you with a clean and properly functioning unit. 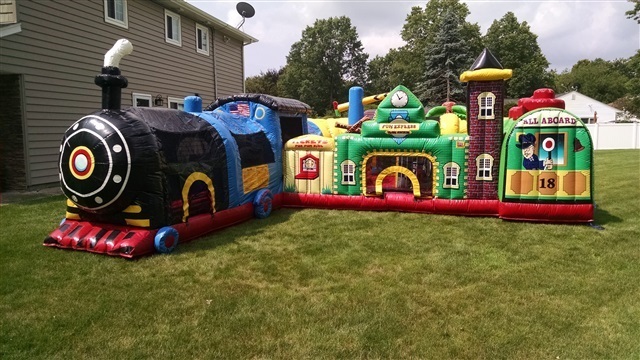 Whether it's a Bounce, Carnival Game, Bubble Machine or one of our many other items, you can be assured that it will be delivered clean and ready to provide the fun you expect. Fun Express Train Station - Perfect for children 1 - 4 years old. The Fun Express Train Station is a great Toddler Interactive play structure which begins with a front-loading obstacle entrance taking kids through tunnels and pop ups. The challenge obstacle then leads to an exciting 3 1/2 foot climb and slide. Once in the interior of the station, participants are greeted by a 3D palm tree and a train signal pole and a 2 1/2 foot climb and slide. The exterior art makes kids feel like they are at a real train station, with a ticket booth, a detailed train and even a clock image to make sure the train is on time! Disney Princess 3-D 5 in 1 Combination Bounce House - This Disney Princess bounce has a bounce area, obstacle course, basketball hoop, climbing area and a slide! It is licensed by Disney so you can be assured that it is well made and the graphics are up to Disney's standards. Please see the 3D image at the bottom of the page! It measures 19' wide x 20' long x 17' high. 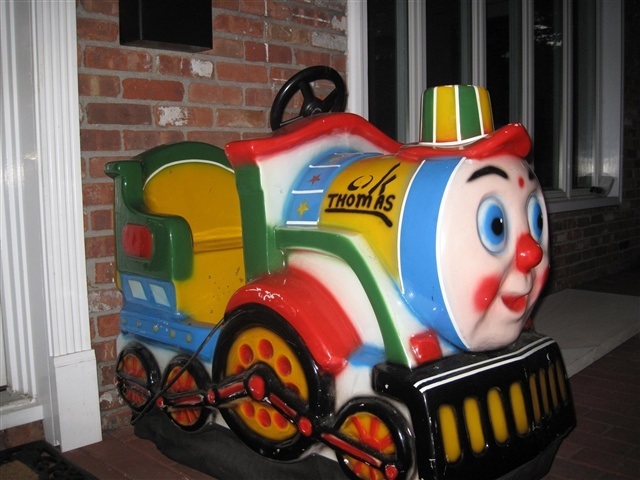 Thomas the Tank Kiddie Ride-On - Just like the ones you see in the mall except you won't have to keep putting quarters in! This is great fun for the little ones that can't enjoy a bounce house yet or the party is indoors. 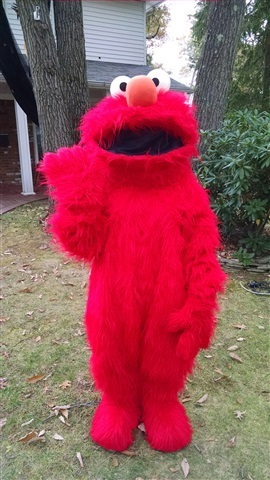 Elmo costume - The kids go crazy for Elmo! We can supply the actor or you can. Costume comes with a CD of Elmo's favorite songs! We also offer other characters along with Airbrush Tattoos including great new stencils that can be used on the face, Clowns, Balloon Art and Magicians. Spin-Art Machines - Looking for something unique for your next kids party, school, or camp event? Look no further....Spin-Art is a great way to give kids an art project to do while creating a keepsake favor to take home and show Mom & Dad. Every child gets a 5″ x 7″ card to place into the machine. Once the card is in the machine, the protective lid is then closed and the machine is turned on. Once the card is spinning the FUN Begins! With the colorful paints provided, the child drips the paint around the card creating a colorful swirl effect. Once complete, the card is then taken out of the machine to dry and the next child ready to create. That's it! Hang it on a wall, or put it in a frame to show it off. * Adult supervision is required. Bubble Machines - Perfect for Proms, Sweet Sixteen Parties, Corporate Events or any place that you want to attract attention. These high output bubble machines will have you swimming in bubbles! Want to get really crazy? Add a scent to the bubbles! Scents Available: Peppermint, Christmas Pine, Gothic, Forest, Mildew, Campfire, Rain Forest, Swampy Marsh, Charred Corpse, Cannabis Hemp, Mojito Mint, Crushed Lime Mint. Affordable Party Rentals provides people across Long Island with a variety of fun options to throw a great party. If you are interested in our bounce house rentals, please contact us today. We service party goers across both Nassau and Suffolk County. Please call 631-889-3924 and receive a free consultation. Tell us all about your party!